Come to the office to check in when you arrive at Camp Mather. The office will be open from 2:00 until 8:00 p.m. After 8:00 p.m., we will post a map on the office window with the location of your reservation circled. Please come to the office the next morning before you go to breakfast to check in and get your wristbands. 1. Your entire party so that we can place the bracelets on their wrists. 2. Picture ID of the main person on the Reservation Form and anyone wishing a 21+ wristband. 3. Your confirmation papers showing that you are paid in full. 4. The make, model, color, and the license plate number of your vehicle(s) on a piece of paper for our records. 5. A note listing anything you need us to know, ie: you are planning on leaving before Saturday, part of your party is arriving later, you require ADA assistance, etc. The office staff will attach your wristbands, give you a parking pass to place on the dashboard of your car, and help you in any way they can. If necessary, the Camp Manager can be radioed for assistance. Day Use will be available this year. Day Use allows access to the pool, lake, and lawn area from 8am - 7pm, but no participation in programs. All Day Use persons under the age of 21 must have an adult aged 21 or over with them at Camp Mather…drop offs are not allowed. Meals will be sold to Day Use Visitors this year. Meals and Day Use wristbands can be purchased at the office, and must be purchased daily. All Day Use persons under the age of 21 must have an adult aged 21 or over with them at meals at Camp Mather. Bicycles are a lot of fun at Camp Mather, and many children learn to ride here. Helmets must be worn by everyone under the age of 21. Never ride your bike on the lawns at the lake or the ballfield. The San Francisco Bike Coalition hope to have volunteers with information at camp to educate everyone about the bike safety of ,how to properly wearing a helmet and the rules of the road. Contact The San Francisco Bike Coalition if you can volunteer while you are here. No skateboards, skates, etc - no motorized scooters, etc. Fire danger is high in the Sierras in the dry summer months. Be sure to monitor your candles at all times. Unattended burning candles are a fire hazard and may be confiscated. Confiscated candles may be reclaimed at the office. Candles should be used in a leak proof container. All cabins come with a picnic table, 2 chairs, a dresser, and beds. Each cabin has a double bed to sleep 2 people and the rest of the beds are twins. You must bring your own bedding. Some cabins have bunk beds; the top bunk should not be used by anyone under age 6. You may request a folding cot to be added to your cabin if you cannot use the top bunk. Bunkbeds will not be removed from cabins. Report any needed repairs immediately to the office so we can make your stay as comfortable as possible. your cabin. Mosquito net "tents" around picnic tables are allowed, and a good idea. Please keep your cabin or tent area looking neat out of respect for your fellow Campers and Camp Mather. Your help in picking up our little ones' litter is greatly appreciated. Wrap ropes around the trees to hang hammocks. Nails and screws damage the trees, and are definitely not allowed. Since new campers put up hammocks in new places every week, the trees are not damaged. You may negotiate with the FoCM General Store Manager for consignment sales in the General Store. 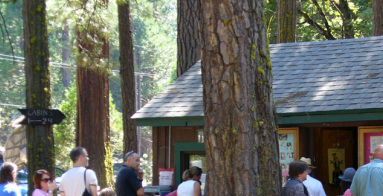 Vendors are not allowed on Camp Mather property. All registered guests are required to purchase meals for the duration of their stay. The meal package runs Breakfast, Lunch and Dinner for each night of your stay. If you would like to have a bag lunch to take on an all day hike, please sign up for it the night before at dinner. You can pick up your bag lunch at breakfast. There are no bag lunches available on the last Saturday of your stay. Guests cannot sell “un-used” meals. Meals are not transferable. There is no such thing as a “meal slot”. If you have paid for a 6 person cabin with only 4 registered people, you may increase your party by 2 to fill the cabin. Contact the Camp Mather office at 415-831-2715 to register your added guests and to pay for their meals at least a week before you are scheduled to arrive. You cannot sell unused meals. If a member of your party is leaving early, there is no refund, and you may not sell those meals. The dining hall is open at 6 a.m. for coffee, tea, and cold cereal. Guest breakfast is served 8 – 8:30 a.m. Lunch is served 12:00 – 12:30 and dinner is served 5:25 to 6:30. We will continue to serve meals until the lines are gone after the end time. Please bus your trays to the bussing window or the bussing area on the deck and alert the staff to any problems in your dining area (spills, etc). If you have allergies and wish to bring non-wheat products, for example, we can store your special food in the kitchen. Call to discuss prior to your arrival: 209-379-2284. Please do not enter the dining hall between meals or before the doors open for guest lunch and dinner. The FoCM General Store is open for your convenience and there is a water fountain near the dining hall deck. If you have friends who did not get a reservation, but are staying nearby, please let them know that they can purchase a Day Use and wristband meals at Camp Mather on a first come basis daily and that the office opens at 8 a.m. Hint: If you know in advance that a member of your party is only staying 3 nights, don’t register them when you first sign up as you will have to pay for a full week's meals. After you are given your reservation, you can add the short timers to your reservation and only pay for the meals they will use. Note, you will be charged a $15 change of reservation fee at that time. Note: despite 3 huge meals a day, most campers bring snacks to camp. Please store them in hard plastic containers to discourage field mice, squirrels, skunks, raccoons, bears, from joining the party. All tentsites and cabins have picnic tables.…. Do not leave food unattended on the picnic tables. Clear your porch and picnic tables over night to avoid nocturnal visitors. The smell of human food is very attractive to many wild animals (skunks, bears, and squirrels, to name a few) who will do their very best to get to the food they smell. Please use the large green bear proof garbage cans. Do not put anything that smells in the bath house garbage cans. The garbage is picked up every day, please don’t wait until Saturday check-out time to take out your garbage. We recycle cardboard, cans, glass and plastic bottles. We also have new pre-sort brown colored bear-proof recycling centers for recycling cans, glass bottles, and plastic bottles. The other recycling cans are the white ones next to the green bear-proof garbage cans. Please instruct your children not to put garbage in the recycling containers. If you have cardboard, flatten and fold it please pull the bottom apart to flatten the box and slide it between the garbage can and the recycling can. place it next to the garbage cans. Please bring any empty propane cans to the office and we will dispose of them properly. We can also recycle your batteries. Label your possessions. If you do lose something, come to the camp office and fill out a loss form. You may also put a notice up on the board outside the dining hall entrance. We will return your property to you if it is found and turned in during your stay. If it is returned later, we will return it to McLaren Lodge and contact you. We register all found items. Unclaimed items will be donated to charity at the end of the summer. Please be kind to our crew and the next week's campers by removing your garbage and sweeping the floors or clearing your tentsite before vacating by 10:00 a.m. on your last day. We have only 2 hours to dust, sweep and mop 100 cabins each Saturday. Please fill out the camp survey at the office before you leave!